Mysore Bonda | Ulundu Bonda is a Popular fried snack from Mysore, Karnataka State.This is Traditional Evening snack Recipe.This tasty Bonda is Normolly Served With Coconut Chutney & sambar. Soak the Uard dhal 3 -4 hrs, grind well. Add rest of the all ingredients except oil, to make a fine smooth paste. Heat oil in a pan, make small balls & deep fry in oil. Fry until golden brown & serve hot with chutney & sambar. When i read the titile , i was like oh i want to have one . Lovely golden fried Bondas those are! Nice snack for a rainy day. looks neat n perfect with a cup of hot tea. Although I do not understand what Urad dhal is they look very tempting. I make this often with tea..Looks perfect..
ooh, yummy bondas! inviting me to taste them. The bonda post is in pending in my blog! Lovely with chutney! Yummmmm entry, perfect with tea!!! yummy bondas..Have something for u in my blog,check it out!! 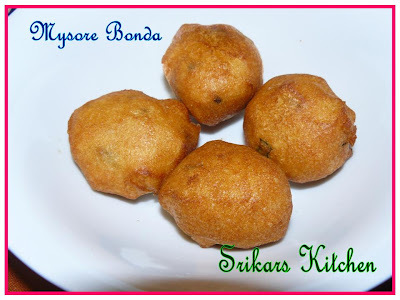 perfect snack on rainy day...looks mouthwatering..
bondas look terrific Sripriya. We usually make bondas with potatoes.. this one is new to me. 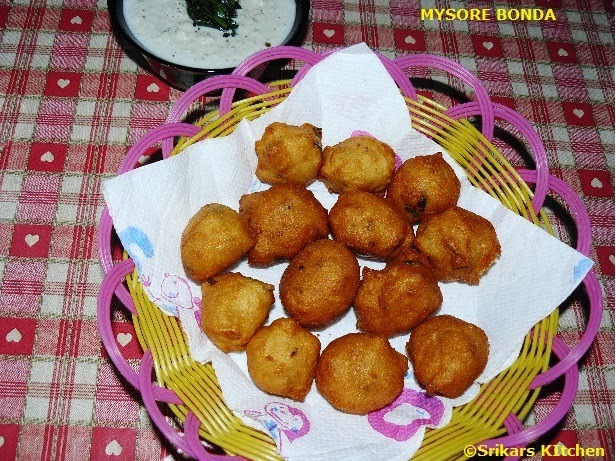 Yummy..looks delicious..i love this bonda with coconut chutney..; a perfect combo..
Mysore bondas with coconut chutney, wow!mouth watering...i want to have one . Considering how much like ulundhu vadai.. I don't know why I never make these bonda.. looks golden and perfect.